Happy New Year to you! We thought we'd take this opportunity to update you on the events of the last month or so and share some of what's ahead for us in January. As always, please stay tuned to the end of this post to read our list of prayer requests. We really appreciate your prayers! The last 2 months have absolutely flown by - it's hard to believe that we've lived at PDF for two months already! November saw us adjusting to our new life here at PDF and figuring out our new routine. 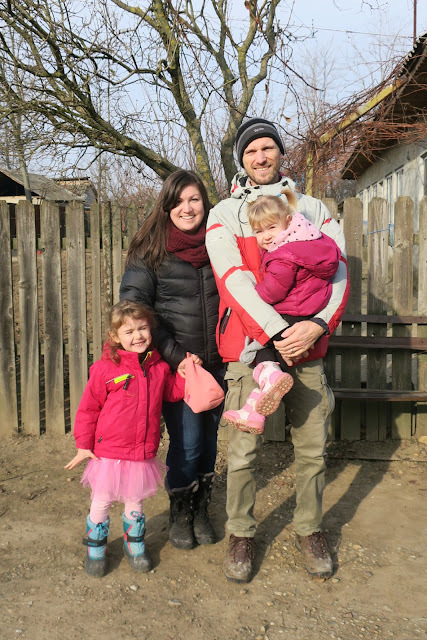 Miriam began attending a German/Romanian Kindergarten in Rasnov in November and even though it's been a HUGE challenge for her to make friends and communicate with her peers, she's really enjoying her mornings there and is learning many new German and Romanian words every week. 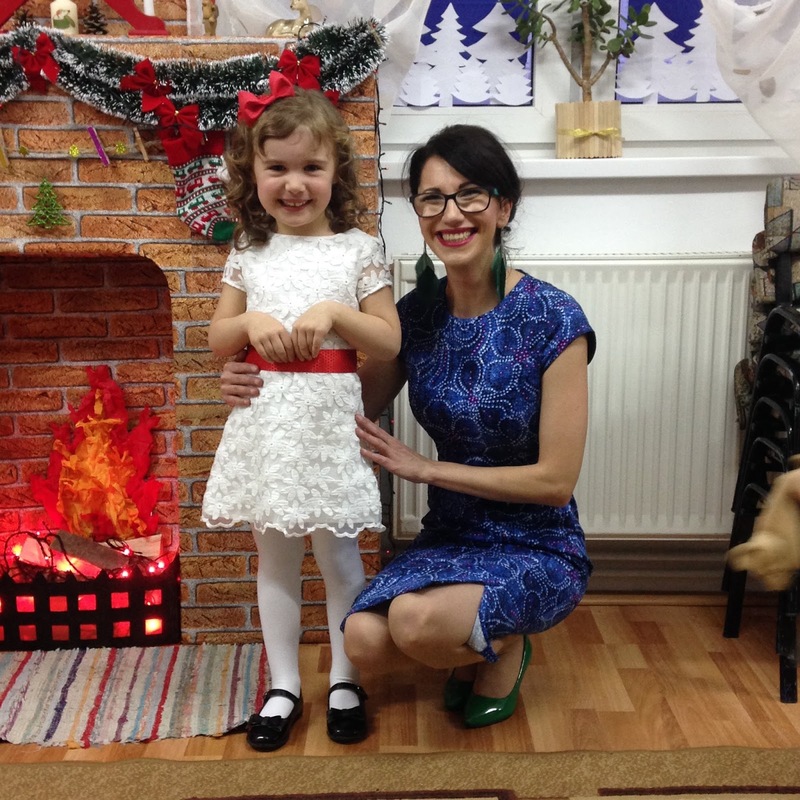 She even participated in her Kindergarten's Christmas Concert in December (pictured below with her teacher). We're hopeful that Miriam's language skills will continue to grow as she goes to Kindergarten every day and Eden is already asking to go to school with her sister (she'll have to wait until the fall)! For now Eden is enjoying spending the mornings with me (Chrissie) either at home or running errands or grocery shopping in Brasov. 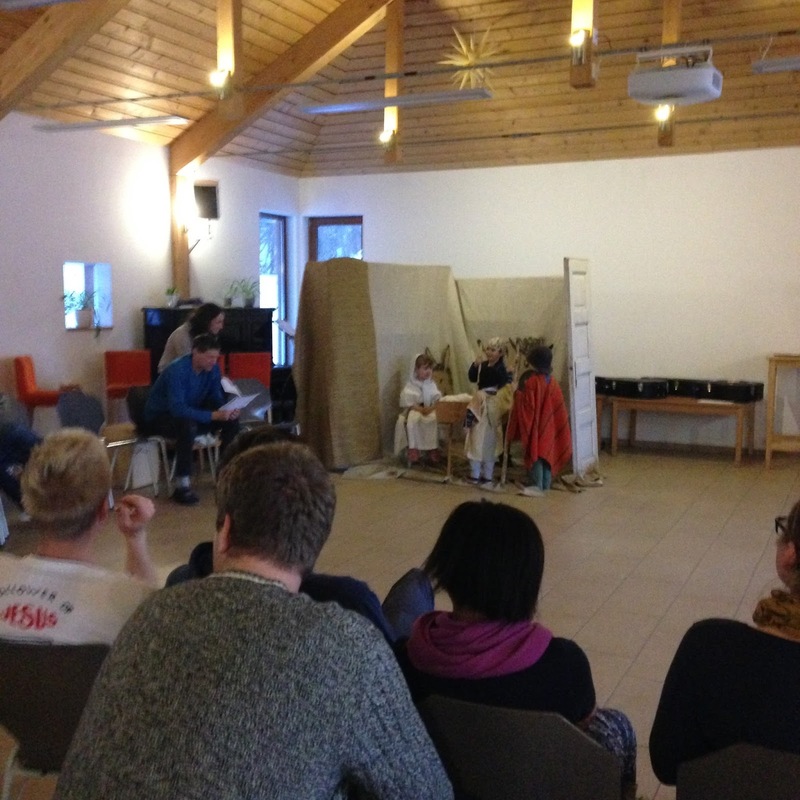 Both girls got to participate in the PDF kids Nativity play this Christmas, which was a lot of fun. Miriam played Mary and Eden was one of the Magi. We've been keeping up with our language classes 2-3 times per week and Jerry has been hard at work preparing for the upcoming Bible School that's planned for April-June: creating brochures, communicating with students from all over the world, working on the PDF website and a bible school promotional video, leading prayer meetings, and giving presentations to visiting Romanian groups about the Bible School. He's also been working hard on the PDF social media, trying to increase PDF's presence on Instagram and Facebook, specifically to the international community for the purpose of spreading the word about the new Spring Bible School. He's also been involved with planning a brand new wilderness program for young adults here at PDF that will begin this summer, and he's also the point person for the Torchbearer's PrayerNet. He works mainly from his home office upstairs, although he does spend a fair amount of time at the centre for meetings, etc. It's been nice to eat lunch as a family almost every day since we moved here and Jerry's really enjoying having a hot lunch every day after taking sandwiches to work for the last 13 years! Unfortunately after a healthy November, December found us sick again with nasty colds and coughs, the stomach flu, sinus infections, and even another ear infection for me (Chrissie). This meant a few doctor's visits, missing out on lots of fun Christmas events and feeling pretty miserable most of the time, but we made the best of it and tried to have thankful hearts through it all. We have a comfortable home with comfortable beds, we have our own washer and dryer, and we have access to healthy food and clean water - these are all things we found ourselves thanking God for during our time of sickness! Our car also broke down in December and needed the clutch replaced, a repair we knew we'd have to make to our car in the next few years but we didn't anticipate needing to make it so soon. Of course this was another frustrating thing to add to our already frustrating month of illness but thankfully car repairs in Romania are far less expensive than in Canada; our entire clutch replacement was less than $350 Canadian dollars. Surprises like this are never an easy thing but we're thankful for God's provision in this situation. We also received another expensive surprise at the beginning of December: we owe over $1500 (Canadian dollars) in processing fees and legal fees for our Romanian visas. This expense is far greater than we ever anticipated and right now we do not have the any of the funds in our support account to pay these fees. Instead of freaking out about it, we're thanking God that he provided our visas for us so we're able to live in Romania and we're trusting that God will provide for this ministry expense since He's the one who brought us here in the first place. 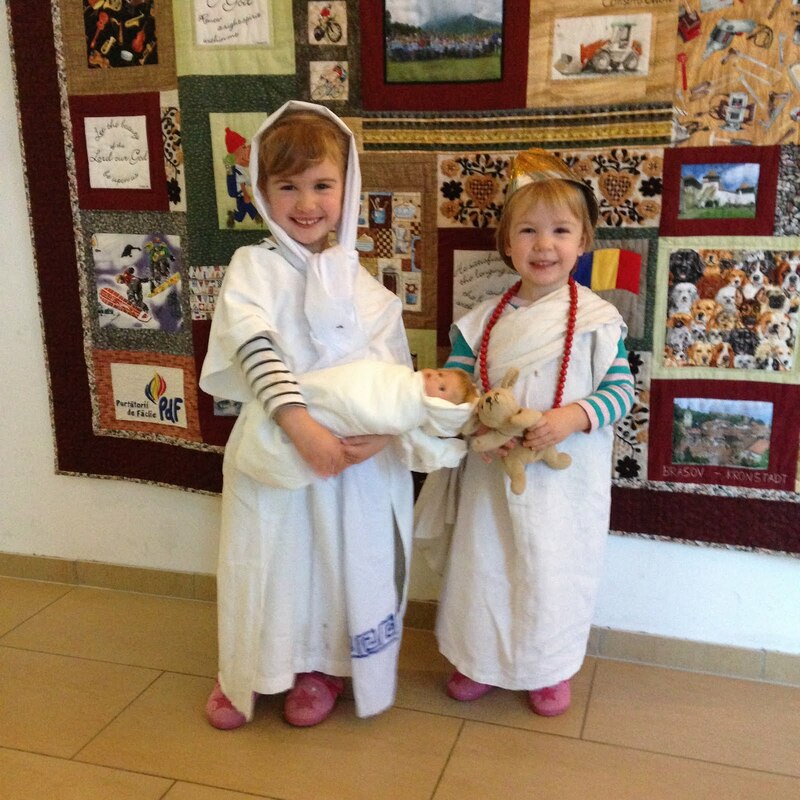 Since we moved to PDF we've been attending the Biserica Harvest Metanoia Brasov church on Sunday mornings. We've really been enjoying the services, despite the obvious language barrier, and it reminds us so much of Riverwood, our church in Canada (there's even a small coffee bar in the back of the auditorium!). 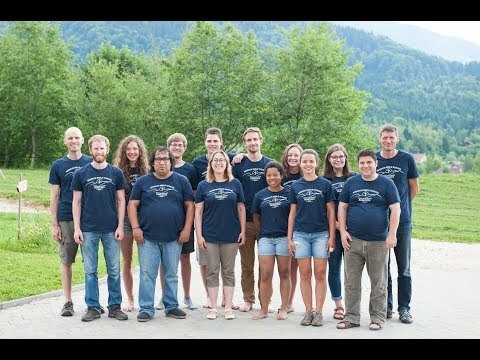 We were invited to Cristian and Simona Cherechean's (the pastor and his wife) house for lunch a few weeks ago and it was so great to hear their heart for the mission field of the Brasov area and to learn a little more about the spiritual needs of the people here and how God is working in Romania. We've also connected with Camelia and Doug Howey, a Romanian-American couple from Kansas City who have planted a church called Izvorul Vietii (Source of Life) in Rasnov, only 6km away from PDF. We had dinner with them at their home in November after randomly meeting Doug at the mall in Brasov and we've connected several times since then, once to participate in their church's Christmas service (Jerry helped lead worship while Chrissie stayed home with sick kids!). They have a 4-year-old daughter who speaks English, and of course our girls adore spending time with her. She's their only English-speaking friend at the moment, so their relationship with her is pretty special for them (and for us!). We will be attending their church in the new year as well (they meet on Sunday nights) and will help lead the worship there as there's no one at the church who plays an instrument. Leading worship in Romanian will be a HUGE challenge for us, but we're really excited to be a part of this church plant and to become involved in the community of Rasnov. As we look ahead to January we're excited for a whole new set of challenges that will come with Jerry teaching snowboarding for the Romanian ski camps that happen for the months of January and February. He'll be teaching snowboarding at several of the camps and may even teach skiing one week if he's needed. He'll also be lecturing one evening each week on Ezekiel 36 (about Spirit), so he's busy preparing for these teaching times. He's also one of the worship leaders for the ski camps, so this upcoming week he's leading worship every evening in Romanian. The winter season here is pretty intense for the ski/snowboard instructors since the ski camps include ski and snowboard lessons during the day and a spiritual development program in the evenings that's also run by the PDF staff. We're looking forward to this busy season and we really appreciate your prayers for good health, lots of energy, and patience. We also plan to continue with our language classes as often as we can this winter. As challenging as the last several months have been for all of us we are more sure than ever that this is where God wants us to be, and we are so excited for all God is doing here in Romania and at PDF. We're so thankful that even through the hard times and the painful surprises that He is always faithful, and that His glory and goodness is revealed to us as we struggle and persevere. Thanks for partnering with us in friendship, in prayer, in love, and in financial support. God is using YOU in our lives and in the lives of the people here in Romania and we're so blessed to have you as our friends and partners. If you want to know more about why we're living in Romania, click here to read more about our work here, and click here to see a video of our story. - Please pray that our health is restored! We are being hit with so many viruses and it's making everyday life even more challenging than it already is with 2 young kids in a foreign country. Please pray especially for Jerry's health as he'll be teaching snowboarding outdoors almost every day this winter and he'll need lots of good health and energy for this! - Please pray for Jerry's teaching on Ezekiel 36, that he'd be led by the Holy Spirit and that his teaching would have an impact on the ski camp participants each week. - Please pray for safety for the ski camp instructors and participants, that there would be no injuries or accidents. - Please pray for our Romanian language skills to continue growing during this busy season. 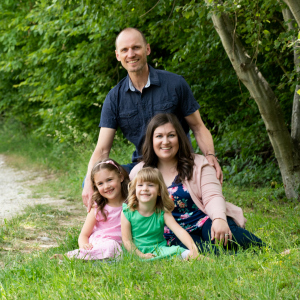 - Please pray for the churches of the Brasov area, specifically for Doug and Camelia's church Izvorul Vietii - that God would grow their church with people from the community of Rasnov who are lost and searching, and that it would grow into a dynamic worship community. - Please pray for our financial support situation. We are functioning at 65% of our required support amount and several months we have been below 60%. Because of this, we don't actually have any money in our monthly support budget to pay for our health insurance ($350/month), our vehicle insurance ($500/year) or ministry expenses like language classes or supplies ($100-200/month). We also mentioned another large financial need above ($1500 Romanian visa fees). Please pray that God would provide these amounts for us through monthly donors or one-time donations.